In Ribera del Duero, the original first growth - in fact the original first growth of Spain - is Vega Sicilia. My visit to Vega Sicilia did not pan out this time, which is a shame as I would have loved to check back in at this historic property. I did however make a point of visiting two wineries who each in their own way are challenging vega Sicilia's long standing primacy in the area. If Vega Sicilia resembles Latour in its power, structure, and longevity, then Dominio de Pingus is Le Pin or Petrus, an analogy that to me makes perfect sense given Danish owner Peter Sisseck's winemaking start on the right bank. In fact, he not so long ago began making wine there again in St. Emilion. What's more, the Pingus pricing certainly resembles a top-notch Pomerol as the first wine these days goes for close to four figures and is easily more than 2x that of Vega Sicilia. To be fair, the Flor de Pingus represents a taste of the house style for a lot less at $80 per bottle. Without re-telling the entire story, basically, Peter Sisseck came to Spain to manage his uncle's Hacienda Monasterio estate, then went on to found Pingus with the idea of challenging the world's best wines. He somehow managed to sneak a bottle of the '95 Pingus to Parker during the 1996 Bordeaux en primeur campaign and the rest is history, highly pointed "one of the best young reds I've ever tasted" history. Oh, and the first shipment of this coveted, pointy elixir did not make the journey overseas, sinking somewhere around the Azures. If that sounds a bit snarky, it is because I am skeptical of nearly four figure wines, of an overabundance of un-challenged received wisdom, of wine critic group thinking and of deftly marketed wines. I went to Pingus because I wanted to be proven wrong. Wrong, right, or in between, I was there to learn, and thanks to team member Yulia Zhdanova, I discovered a lot about what makes this such a unique project. In two words, it is details and observations. Observations such as Peter's first noting the high-quality old vine material in the La Horra district of Burgos, just several kilometers east of Roa. Details such as hiring two different biodynamic consultants ("one for tinctures and one for extractions"), each working independently, and then evaluating their data and input with regard to soil types, and recommending treatments, then acting on that information. Pingus consists of five Taransaud foudres worth of wine, the second label Flor de Pingus is 16 small stainless steel tanks, and then both of these are barrel aged in primarily Taransaud T5 barrels. In earlier times, the new oak was predominant and these days they are moving away from new barrels. Psi is the newest cuvee, a blend of fruit purchased from growers that Peter and his vineyard director, Pablo Rubio, thinks are growing good fruit, cultivating the land organically. Barrel samples of all three in two vintages, the solid, fairly productive 2016 and the frost shortened (shortened in terms of production volume and vegetative cycle) 2017. Psi was about the fruit, Flor de Pingus was richer and oakier, and Pingus was significantly less marked by oak, more structured. While the Dominio de Pingus' scarcity and price does not make it a wine for the rest of us, we do receive an annual allocation of the Flor, and will continue to track the development of Psi as it truly is an interesting project, noteworthy for its motivation of preserving old heirloom Tempranillo clones, by offering growers better than market pricing for well farmed fruit. Dominio del Aguila is the region's newest critical darling, and if the recent rave Parker reviews are any indication, now is the time to begin buying and cellaring these wines, because they are by design another smaller scaled project without too much wine available, though man, are these wines good. When Jorge Monzon, from the Burgos village of La Aguilera, first met his wife and partner Isabel Rodero, he apparently showed her his family's treasured old vineyards after knowing her for just one week. He told Isabel not to worry about there ever being another girl competing for his attention, that the only competition she would ever have would be from the vines. Monzon grew up with vines and wine in Ribera del Duero, then went off to Bordeaux to formally study. He was unhappy there and asked to transfer to Beaune, where he excelled and earned a coveted stage at DRC (likely one of the toughest internships to land in the world of winemaking). 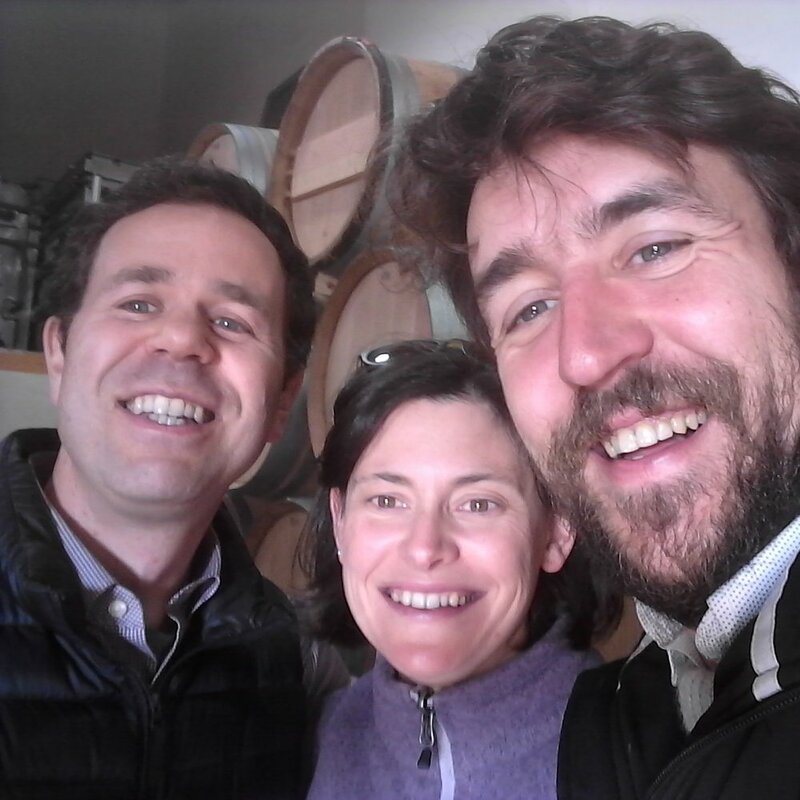 He then returned to Ribera del Duero to oversea the winemaking at Arzuaga, a winery located adjacent to Vega Sicilia, where Monzon also worked for a while on their highly secretive, 10 years long (and ongoing) experiment producing a top quality white wine from the region. Jorge married Isabel, an architect by training, and I can't help but think that the attention to detail in this personal project is at the highest level. So that is the origin story. Unfortunately we did not have time to see vineyards together, which is probably just as well as it would have been depressing due to the frost damage this year, the second consecutive year of it, which can not only be devastating for production volume and sales, but can even seriously injure or kill a vine if the damage is extensive. Isabel and I spent our time barrel tasting and chatting, discussing the various vineyard sites and their influence on the wine's flavor. Barrels are from various Burgundy cooperages and are trending towards formats larger than 228 liters and away from new oak. Tasting these wines out of barrel was enlightening, not simply because they tasted really good (which they did!) but because they were hard to place. The chalky minerality and tannins, as well as the darker tinto fino RDD fruit was there, but there was also a life, a brightness and intensity that to me reflects the earlier picking of great, relatively cooler vineyard sites, as well as the addition of white grapes and traditional red varieties not commonly used in the region. It's a bit lazy and overly simplified to make comparisons, but I think that if Vega Sicilia is Latour and Pingus is Le Pin or Petrus, maybe Dominio del Aguila is Georges Roumier, or Domaine Fourrier. While there is not yet a long track record here to make such a bold comparison to some of Burgundy's best, there is someone with the deep-seated knowledge of family vineyards as well as the pedigreed Burgundy training, to quickly bring Dominio del Aguila to such a high level. That said, last time I checked, Roumier does not make a clarete rose from a mixture of red and white grapes, or stunningly good albillo that perhaps resembles Corton Charlemagne. That you can only find in the small 16th century underground cellar of Dominio del Aguila. Jorge joined us at the end of our visit, slightly dejected from his observations of frost damage in the vineyards. After a brief chat and a small glass of Picaro, their entry level red wine which, like all their reds also contains some white Albillo grapes as well as other varieties not common in the area these days, such as Bobal, we began to talk about travel, about our kids and I think Jorge was starting to feel just a bit better. He joked that he wore his best looking sweater today to look handsome for his wife. We ended the visit taking this selfie.